In an exclusive interview given to the British print magazine Motorcycle Racer, Kawasaki’s Eric Bostrom flatly states his goal is to be racing in the new four-stroke MotoGP championship “from the start”. 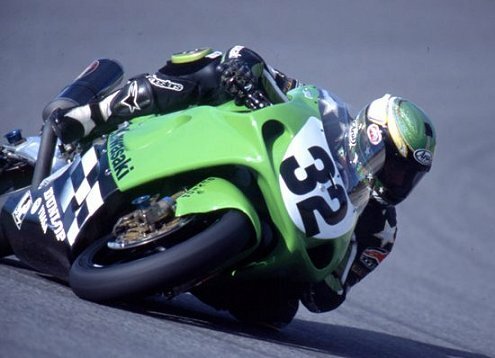 Since Kawasaki won’t have a MotoGP four-stroke ready until the 2003 season, Eric presumably means he will race in that class as soon as Kawasaki is ready. As we reported earlier, Eric Bostrom will race several World Superbike rounds next year (not just Laguna Seca). As we speculated at that time (and it appears to have been accurate), this is to familiarize Eric Bostrom with some of the World championship tracks — presumably those tracks shared by WSB and the Grand Prix series. Kawasaki is very high on Eric Bostrom’s future, and is anxious to keep him on a green machine. Kawasaki will be entering the Moto GP championship after more than a decade of absence from the 500 GP class — it simply didn’t want to race two-strokes. Triumph and Sauber Attacking WSB Together?